Whew, wow, my title is a mouthful. That's a lot of phones to compare and I've reviewed all four mobile phones: Google Nexus One, HTC Legend, HTC Desire and Sony Ericsson Xperia X10, I just want to create a side by side comparison of the four latest Android mobile phones so that those still undecided about which mobile phone to get, can make an informed decision. Let's face it, though it's superficial, the design of a mobile phone can play a big factor whether you will fork up your hard earned cash. If design is the main thing that you would consider amongst these phones, would you say you'd rather have a bigger screen, a thinner phone or a phone made of metal? In terms of screen area, the Sony Ericsson Xperia X10 has the bigger screen of the four, coming in at a massive 4 inches. The Nexus One and HTC Desire comes a close second having a 3.7 inch screen area while the HTC Legend only has a 3.2 inch screen though it looks larger because of the unibody design. If you're going for a thin mobile phone, the Nexus One and the HTC Legend is a hair thinner at 11.5mm compared with the HTC Desire which is 11.9mm thin. The Xperia X10 is the thickest of the four at 13mm. In terms of build quality, no doubt the HTC Legend comes on top because of its unique aluminum unibody. One would think that the HTC Legend would come out on top in terms of design but there's nothing really eye-catching about the HTC Legend. In fact, in my HTC Legend Review, I've mentioned that a lot of people mistook it for the HTC Hero. 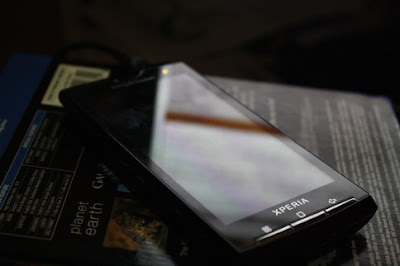 It's surprising to know that the Xperia X10 actually looks more sexier of all even though its made mostly of plastic. The sharp edges and large screen just brings a sophisticated look to the X10. Check out some pictures I've taken of the X10 on my Sony Ericsson Xperia X10 Review to see what I mean. HTC made the Google Nexus One, HTC Desire, and HTC Legend while Sony Ericsson, well, who knows who are now making their handsets. The thing is, both companies are not exactly getting medals and praises for their customer service. Last year, Sony Ericsson temporarily stopped selling their Aino's because of firmware issues and there are a lot of complaints from customers regarding the build quality of recent Sony Ericsson phones. As for HTC, though they don't have history of pulling out stock and there are lesser complaints about the build quality of their phones but the again this may be because most HTC phones are high end smartphones so there are less users compared with Sony Ericsson's phones. Though its HTC who made the Nexus One, the reason for the delay of this handset in the UK is because Google is setting up a customer service team here that would help with any technical problems with the Nexus One so this might be a point in favor of the Nexus One, if ever Google decides to release it in the UK. The HTC Legend is behind in terms of processing power having only a Qualcomm MSM 7227 600 MHz processor compared with the Desire, Nexus One, and Xperia X10 which all have a 1GHz Snapdragon processor. RAM is another thing to consider when it comes to a mobile phone's speed as the higher the RAM, the more applications you can run on your smartphone. The Xperia X10 and the HTC Legend is lagging behind in this department with only 384MB of RAM compared with the Nexus One's 512MB RAM and the Desire which has 576MB of RAM. The clear winner when it comes to power is the HTC Desire with the highest processor speed and highest RAM available. But unless you're a hacker who wants to run a bunch of 3D games simultaneously or run multiple applications at once, do you really need all that power? Of course, the higher the processor and RAM also means that your phone is a bit futureproof to the coming Android upgrades. But there's really not much difference with the Legend's processor over the X10 or the Nexus One. The only noticeable difference is like the difference you'll notice between the iPhone 3G and 3GS. The X10 and the Nexus One, with their 1GHz processor just seems more snappy. Now here's where we get down and dirty. The HTC Legend, HTC Desire, and Nexus One runs on the latest version of Android (2.1 Eclair) while the Xperia X10 at launch will only have the Android 1.5 version (though there are some speculations that it will now have 2.1 too). While having Android as an OS means you get essentially the same features, the user interface can vary amongst these mobile phones. The HTC Legend and HTC Desire both have HTC's Sense UI while the Xperia X10 will feature Sony Ericsson's unique interface too. The Google Nexus One doesn't have any skinned UI but the original Android interface or vanilla Android as some call it. The advantage of getting HTC's Sense UI is that if offers additional features such as FriendStream, a widget which updates you on the status of your friends from different social networks. It's a cool feature though if you're not a social networking nut, it's not really a very useful feature. HTC's Sense also offers HTC's keyboard which I think is actually quite better because symbols and numbers are shown on top of the traditional alphabet QWERTY keyboard so instead of pressing the symbol button every time you want to enter a number, you can just press and hold a letter. The Xperia X10 doesn't have a deep UI but more of skinned Android. While HTC Sense offers a lot of widgets to customize your homescreen, X10 offers Timescape and Mediascape UI. Timescape is like HTC's Friendstream but has a cooler animation. Both the X10's mediascape and HTC's own media player only makes the standard Android Media player more pretty but doesn't add any equalizers. The X10's Timescape and Mediascape may not be as advanced as HTC's Sense but it's much simpler and you can turn it off. The advantage of Vanilla Android UI is its simplicity. Traditional Android users or those with the G1 or Vodafone Magic will feel right at home with the Google Nexus One.Another advantage is that since it's the Google Experience, it's easier for devices (especially with the Nexus One) to get frequent firmware updates since any custom UI need to be compatible with any new Android OS that will be released. All Android phones will eventually support Flash content but right now, it's only the HTC Desire and the HTC Legend which will initially have Flash built-in. This will allow you to surf websites with Flash content, or for Facebook games addict, this means you can play Farmville on your phone. The Nexus One on the other hand, will have Google navigation, the first free turn by turn navigation software but only in the US and in addition, the Nexus One has noise cancelling feature. The Xperia X10 on the other hand has the first 8.1 megapixel camera on an Android handset. The Google Nexus One comes out on top in terms of telephony because of its noise cancelling feature but the HTC Desire comes close second even without noise cancelling, its able to cancel out background noises when you're on the phone. Although the HTC Legend is the same as the Desire, the poor reception because of its antennae issues hinders its telephony features. Because the Desire, Nexus One and Legend all sports Android 2.1, the messaging features are almost the same although I couldn't understand for the life of me why on the Legend, there's no picture thumbnail on the SMS inbox while its present on the Desire and Nexus One. I prefer typing on the HTC Desire because, I don't know, the text input is just responsive compared with the others, next would be the Nexus One, and then the HTC Legend only because its smaller screen prevents typing faster and last would be the X10 because there seems to be a firmware glitch on mine and the keyboard is sometimes unresponsive. You can check out sample pictures on each of my individual reviews of each mobile phones through the links on the first paragraph. Wow, Android really has become fragmented. I mean in 2008 there's only the G1 and Vodafone Magic, in 2009 there's the Samsung Galaxy, Motorola Milestone, T-Mobile Pulse, and the HTC Hero, this year, in addition to the previous handsets mentioned we have these four new handsets and we're not even halfway through 2010 yet. For Google, this may be a good thing. The more android handsets there are in the market, the more their market share but for us end users, this is a bad thing. So in conclusion, let me just list down the advantages of owning each handset. For the HTC Legend, you get a cool aluminum unibody, HTC Sense, and Flash Browser. With the HTC Desire, you get 1 GHz processor, bigger RAM, HTC Sense, Flash Browser. For the Nexus one, the advantage is the 1GHz processor, noise cancelling, probably more frequent updates because its a google phone and with the X10, you get 1GHz processor and an 8 megapixel camera. So the real question is, which feature is more important to you? Very confused as well but leaning more towards the Legend because it'll probably be the cheapest of the four. Yeah, you should definitely include the Samsung Galaxy spica in this comparison now that it has the updated 2.1 OS. In my country (Denmark) it looks as if legend and Desire will be prices almost the same. Being a happy owner of the Hero, I really have difficulty deciding between Legend and Desire. Couldn't they just have used a unibody for the Desire? However, some reviews have stated that the Legend's casing actually has a negative impact on reception, 3G AND Wifi. @ Yeah, heard that too. Probably the reason why Apple didn't make use of the unibody on their iPhones even though they're the first one to do it on their macbooks. Love the Legend's design too and if its the same price as the Desire then THAT's a really big problem when deciding what phone to choose. Me, I'm still undecided. I feel like my heart's still set on the Milestone because of its physical keyboard. I'm getting the Desire. Though I like the Legend's design, there's not much price difference between the Desire and Legend so I'll go with the Desire. A lot of people are saying that Nexus One is dead because of the Desire but I beg to disagree. Like what you've mentioned, since the N1 will have native Android, it will be easier to update and with Android 2.2 coming up, Google promised a few more surprises with the Nexus One so it's far from dead and I'll actually be getting one from Vodafone.